The bulk of investigations into the Russian mafia usually come to nought or are not carried out at all. Specific provisions in international legislation require Russian law-enforcement agencies to be involved in the investigations of trans-border corruption. In effect, such cooperation is consistently sabotaged, which elicits complaints from European prosecutors. The details of several such cases have surfaced only through the efforts of civil rights activists and civic movements. Since 2011 Maria-Antonella Bino, Swiss federal prosecutor, has been conducting a criminal investigation of the money-laundering schemes in operation in Switzerland and uncovered by Sergei Magnitsky, who had shown that this money was stolen from the Russian Treasury through scams involving fraudulent tax refunds1See http://www.svoboda.org/a/24350686.html. The criminal case was opened following a complaint filed by the London law firm Brown Rudnick on behalf of Hermitage Capital Management Ltd as part of the “Justice for Sergei Magnitsky” campaign. Although the company’s founder and CEO Bill Browder is optimistic about the outcome of the investigation, there is no guarantee that the case will ever be brought to court. In 2012 Alexander Perepilichnyy, a key witness against the Russian officials implicated in the case and the main whistleblower working with the Swiss on the Magnitsky case, died in London in mysterious circumstances2See http://www.bbc.com/news/uk-21815214. There has since been no official news on the outcome of the investigation. In 2016 it transpired that some of the money looted from the Russian Treasury had been wired to the bank account of Sergei Roldugin, a cellist and Vladimir Putin’s old friend. This discovery has become a sensation and raises questions about the possible connections between the scam artists filing bogus tax-refund claims and the Russian authorities3See https://www.occrp.org/en/panamapapers/russia-the-cellist-and-the-lawyer/. The EU is faring no better in bringing such cases to court. For instance, in the pre-investigation check at the Wadan Yards shipbuilding company in Germany’s Mecklenburg-Western Pomerania. Based on suspicions of illegal operations in the firm filing for bankruptcy and its deliberate bankruptcy, the inquiry failed to result in charges being filed. It is a Kafkaesque story that saw Russian investors, including Gazprom’s top manager Vitaly Yusufov, “coming to the rescue” of the struggling German company by promising to revitalise it and safeguard the jobs of the Wadan Yards’ many employees. Instead, the company filed for bankruptcy. Some sources assert this to be a premeditated bankruptcy fraud involving a Russian kingpin, Gennady Petrov4See http://www.fr-online.de/wirtschaft/wadan-werft-volle-kraft-voraus-in-den-untergang,1472780,34990164.html. In 2009 in Sochi, Germany’s Chancellor Merkel personally pressed Dmitry Medvedev, the Russian Prime Minister, for an explanation: “It is rumoured that you and Putin are behind it all” – i.e. the arrival of “Russian investors”5See http://www.spiegel.de/spiegel/print/d-66803938.html. The prosecutor’s office of the city of Schwerin received statements of complaint. One of them was from a Russian national who claimed to have witnessed a crime (having participated in a complex purchasing scenario when the shipyards were acquired). Another came from a Spanish prosecutor who had been digging into Gennady Petrov’s alleged criminal activity for some time. According to a recent comment from the Schwerin prosecutor’s office, they have checked both statements but “found no ground” for opening a case. In such a situation a little more clarity would not hurt, but the prosecutor’s office has said it neither has nor intends to issue any extended commentary on the inquiry6See http://www.fr-online.de/wirtschaft/wadan-werft-volle-kraft-voraus-in-den-untergang,1472780,34990164.html. Reading between the lines of this refusal to provide an official explanation, the press suggests that what we are dealing with here is a political decision “not to upset the Russians”. At any rate, the case has clearly been discussed at top level. Nail Malyutin, the witness in this case, is currently represented by lawyers provided by the non-governmental Open Dialog Foundation. It insists Malyutin was the first to seek justice and to report on the fraudulent plan to buy the shipyard with public funds, and that following his statement to the prosecutor’s office, Russia initiated a criminal case against him, accusing him of financial embezzlement7See http://en.odfoundation.eu/a/7604,report-the-case-of-nail-malyutin. “In the aftermath of the attacks of 9/11 Russian organised crime is no longer on everybody’s lips. Both the political circles and the media are fully preoccupied with the terrorist threat. Besides, considering the mafia’s proximity to the Russian establishment, a thorough investigation of this phenomenon is potentially wrought with serious complications and risks for Western Europe, which is still dependent on Russian energy supplies,” argues prosecutor Luigi de Ficchy (Tivoli, Italy) in his 2009 report “Russian Mafia and the International Money Laundering”8See http://www.distretto.torino.giustizia.it/documentazione/D_1958.pdf. Luigi de Ficchy mentions the famous 2002 case codenamed “Operation Spiderweb” that led to the arrests of dozens of suspects, including the reputed Russian mobster Alimzhan Tokhtakhounov, also known as “Taiwanchik”. Italian authorities that investigated the case believe the gang was laundering money through the Swiss-based Glencore International AG and the shadowy structures in Russia’s Ministry of Transport (Transrail Holding AG)9See statement # 54431/99-21 issued by the prosecutor’s office in the city of Bologna, Italy, on 3 June 2002 and signed by the deputy prosecutor Paolo Giovagnoli. However, according to de Ficchy, in its 2003 decree Italy’s Supreme Court of Cassation stipulated that from then on, in order to press charges against somebody prosecutors required not just a suspicion of money laundering, but a full proof of the criminal origin of the funds being laundered in the country. “Yet, in order to be able to produce such evidence prosecutors require cooperation on the part of the countries from where these funds have been siphoned off. At the same time, these governments are usually not very keen to offer adequate and prompt legal assistance: they take too much time replying to inquiries, and when they do so their evasive answers are usually inconclusive and of little use for the criminal investigation,” writes the prosecutor10See http://www.distretto.torino.giustizia.it/documentazione/D_1958.pdf. The “Cobweb” case fell apart. Taiwanchik’s attorney Luca Saldarelli noted quite mirthfully that the prosecution in Italy “did not have any evidence on their hands…and was waiting to receive it from the US”11“Коммерсант власть”, 16.09.2002, http://kommersant.ru/doc/341014. Besides, the prosecution simply gave a hint to the suspects that it was enough for them to leave Italy for Russia in order to avoid a prison sentence12“Коммерсант власть”, 16.09.2002, http://kommersant.ru/doc/341014. Taiwanchik is currently residing in Russia and is still wanted by Interpol. The Russian Constitution does not permit extradition of Russian nationals upon a request issued by Interpol. The same thing happened to the Russian mafia boss Gennady Petrov, who was arrested in Majorca in 2008 on suspicion of laundering money gained from criminal activities in Spain. Taking into consideration the time he had already spent under custodial arrest, Petrov was offered a deal: he could avoid imprisonment, but his property in Spain was to be confiscated while he himself faced deportation. Petrov, however, announced that he needed to talk it over with his son (also under police investigation but, unlike his father, residing in Russia at the time). The authorities let him seek his son’s advice, whereupon Petrov promptly left for Saint Petersburg and has not since set foot in the country, which now considers him to have absconded from justice13See http://newtimes.ru/stati/temyi/c47ea037eccec1f40ed9ae5b46032297-delo-rysskoi-mafuu-toluk-sasha-car.html. Meanwhile, international cooperation in combatting transnational criminal activities of the Russian mafia was making headway, albeit in a rather unusual direction. Since Petrov is a Russian national, Russia’s Prosecutor General requested the transfer of proceedings to Russia “in the interests of a better and fair trial” in accordance with the Strasbourg European Convention on the transfer of proceedings in criminal matters of 1972. Had the Spanish prosecution agreed to such a transfer, the case would likely never have reached the court and would have been closed because the statute of limitation would have expired by then. However, it finally went to court in Spain and in anticipation of the trial the indictment was made public. Obviously, this is exactly what the Russian side had feared all along: Petrov should not have signed any deals with the Spanish prosecution in the first place, the proceedings should simply have been transferred to Russia’s Prosecutor General in accordance with the Strasbourg Convention. Upon considering the Russian request, investigating judge José De La Mata turned it down. The Spanish indictment was translated into Russian and posted on the Open Russia website causing a massive public outcry14See https://openrussia.org/media/705344/. The document has been quoted by leading media and and anti-corruption bloggers. The indictment states, among other things, that Petrov’s group has penetrated Russia’s law-enforcement and economic agencies, and is in charge of appointing key functionaries in the national security, defence and law enforcement agencies. In 2011 a different case (featuring Oleg Deripaska, Iskander Makhmudov, Mikhail Cherney and others among its prime suspects) was re-directed to the Russian General Prosecutor’s office for further investigation in accordance with the Strasbourg Convention. These Russian oligarchs are suspected of laundering money through Vera Metallurgica, a subsidiary of Ural Mining and Metallurgical Company (UMMC) – that is, of using legal metal exports as a smokescreen to legitimise illegally gained proceeds. According to Jose Grinda, Spain’s Special Prosecutor for Corruption and Organised Crime, the Spanish prosecution possessed ample evidence against Iskander Makhmudov to press official charges against him and to put him on trial in Spain15See Anastasia Kirilenko’s interview with Jose Grinda, The Insider, 07.12.2015, http://theins.ru/politika/17298. However, the Spanish lacked evidence to indict Deripaska and thus required assistance from their Russian counterparts. When redirecting this case to Russia in accordance with the Strasbourg Convention, the Spanish prosecution could realistically have hoped that the interests of justice would be better served in the suspects’ native land. Technically, the case is still under investigation in Russia and the period of investigation is constantly being prolonged. That the preliminary investigation is still ongoing transpired only after Transparency International sent an official inquiry to the General Prosecutor’s office. 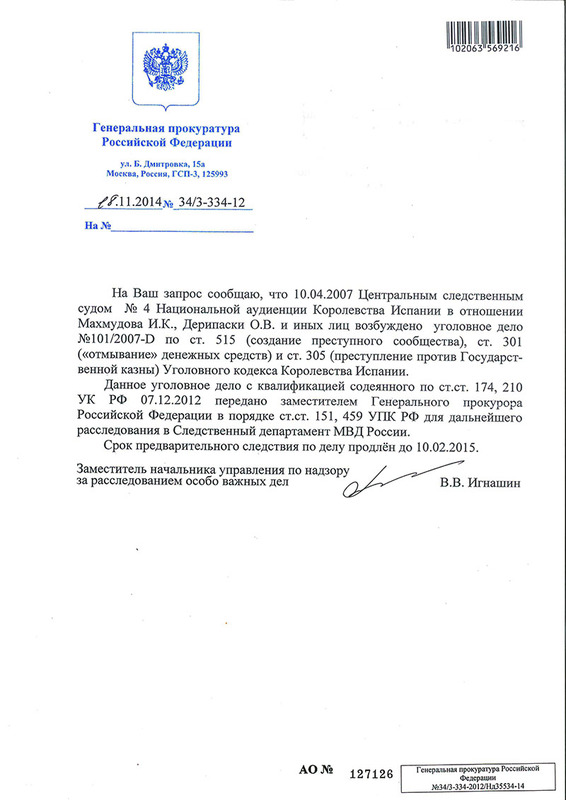 Konstantin Rubakhin, coordinator of the environmental movement Save Khoper National Park, published the reply on his website16See http://rubakhin.org/wp-content/uploads/2015/11/20141205142015801-20151.jpg. According to Rubakhin, the UMMC won the bid to mine nickel in the Khoper region, which is believed would have a disastrous impact on the local environment and public health. Environmental activists protesting against the copper-nickel mining in the region have been physically assaulted on a number of occasions, while Rubakhin himself fled Russia and sought political asylum in Lithuania after the Russian authorities pressed criminal charges against him. However, he managed to pass his question and a formal expert examination report to President Putin, who promised to look into it17See https://www.youtube.com/watch?v=p0jDOEROWt4. Ultimately, Russian authorities instigated criminal investigation against Rubakhin, charging him with “extortion” (he was accused of attempting to extort 7m Euro from the UMMC managers). Recently the case was adjourned for “further investigation18See http://www.svoboda.org/a/28191091.html . It is not unlikely that Russia’s General Prosecutor will ultimately close the Makhmudov-Deripaska-Cherney case because the statute of limitation might has expired. Let us return now to the 2016. The Central Service for the Prevention of Corruption in Nanterre, France, is currently conducting a pre-investigation check following a lawsuit submitted to the prosecutor in Nanterre by environmental activist Yevgenia Chirikova who alleges an “otkat” (a secret commission and behind-the-scene agreement) was paid by the French construction company Vinci to oligarch Arkady Rotenberg personally and his associates in order to win the bid for the government tender for the construction of the Moscow-Saint Petersburg highway. According to the joint lawsuit submitted by Chirikova and NGOs Shepra and Bankwatch to the Nanterre police and the city’s prosecutor’s office, Rotenberg belongs to Putin’s inner circle of friends and associates and is the owner of some of the subsidiaries of Vinci in different offshore zones, created for the sole purpose of carrying out a construction project in Russia, arousing suspicions of corruption and bribery involving Russian authorities19For a synopsis of the lawsuit submitted by Chirokova, Sherpa and Bankwatch, read http://www.documentcloud.org/documents/2722116-2010-05-04-Sherpa-v-NWCC-Letter-From-U-S.html. 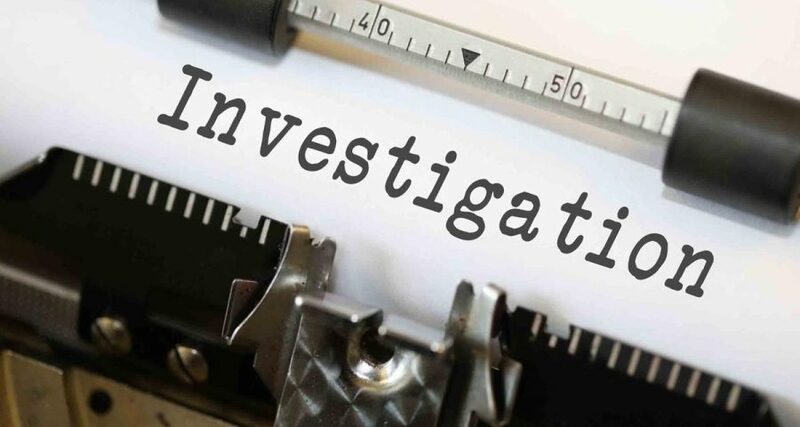 The pre-investigation check has become possible only because of the monumental efforts on the part of social activists and the cooperation of several NGOs, such as Sherpa and Bankwatch, who took an active interest in this story after it had made a splash internationally. In 2008 journalist Mikhail Beketov, who covered the planned destruction of the Khimki forest as part of the highway construction project and the protests of environmental activists who tried to prevent it, was beaten and sustained severe mutilating injuries (including the loss of his right leg and several fingers) that confined him to a wheelchair. He died five years later. However, it would be premature at best to celebrate the positive outcome of the French investigation. In fact civic activists have been trying to initiate criminal proceedings on charges of trans-border corruption between Russia/France since 2013. A French lawyer working with Sherpa on this case explains that “legal cooperation with Russia has not been very fruitful thus far”20Conversation with Julien Larere-Genevoix. Yevgenia Chirikova was told the same thing during her interrogation21See http://www.svoboda.org/a/28150037.html.